Handmade - oven baked. 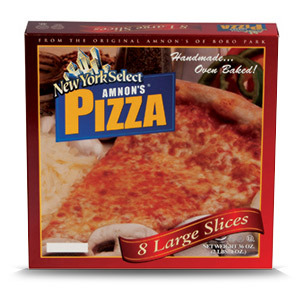 From the original Amnon's of Boro Park. 8 Large slices. No preservatives or additives! Flour, Water, Apple Juice, Cheese, Tomato Sauce, Salt, Garlic, Spices and Yeast. Keep frozen in our resealable bag. Heating Instructions: Defrost. Preheat oven to 400 degrees F. Place desired amount of pizza slices on oven rack. Position in center of oven. Pizza will be heated in approximately 5 minutes. Time will vary depending on oven. Freeze unused slices. 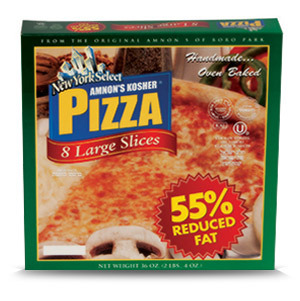 REDUCED FAT 8 SLICE 36oz. Same delicious oven baked flavor with less than half the fat of the original. From the original Amnon's of Boro Park. 8 Large slices. No preservatives or additives! Flour, Water, Reduced Fat Cheese, Tomato Sauce, Salt, Garlic, Spices and Yeast. WHOLE WHEAT 8 SLICE 36oz. 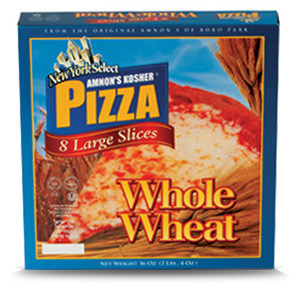 Enjoy Amnon's Kosher whole wheat pizza at home! From the original Amnon's of Boro Park. 8 Large slices. No preservatives or additives! Whole Wheat Flour, Water, Apple Juice, Cheese, Tomato Sauce, Salt, Garlic, Spices and Yeast. REDUCED FAT WHOLE WHEAT 8 SLICE 36oz. 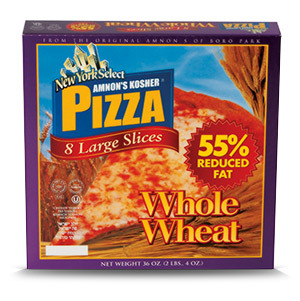 Enjoy Amnon's Kosher reduced fat whole wheat pizza at home! Same great taste at the regular whole wheat version with 55% less fat! From the original Amnon's of Boro Park. 8 Large slices. No preservatives or additives! DEEP DISH 2 PERSONAL PAN PIES 14oz. Delicious deep dish pizza to enjoy at home! 2 personal pies in each box. From the original Amnon's of Boro Park. 8 Large slices. No preservatives or additives! Mouth watering falafel ready in munutes! 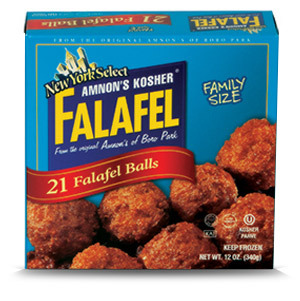 21 falafel balls in each bag. From the original Amnon's of Boro Park. 8 Large slices. No preservatives or additives! Chick peas, flour, salt, onions, garlic, cumin, coriander, baking soda, spices and seasonings. Oven: Preheat oven or toaster to 450 degrees. Place frozen falafel balls on aluminum foil, ovenrack or toaster oven tray. Heat for 8-10 minutes. Frying: Place falafel balls in hot cooking oil & fry for 2 minutes. 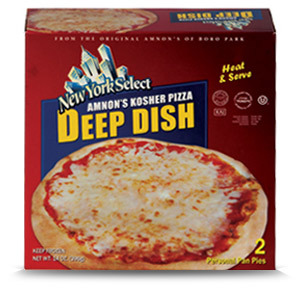 © 2011 Amnons Kosher Pizza. All rights Reserved. Site designed by Rush Flyer Printing.